nossa casa com varanda e piscina está localizada entre Lemona e Kallepia na pequena aldeia de montanha Letymbou. cerca de 20 minutos de Pafos e Polis A casa é cercada por oliveiras e amendoeiras ... ao redor da casa você sempre encontrará lugares ensolarados, mas também com sombra para relaxar. A vista do seu quarto privado é de tirar o fôlego. você olha diretamente de lá para as montanhas Trodos e você pode apreciar o nascer do sol pela manhã. Aproveite a piscina ... prepare uma refeição quente no churrasco ao ar livre. Na pequena cozinha de chá com chaleira, torradeira, liquidificador para smoothies e geladeira, você pode preparar seu café da manhã. Of all the places we have stayed in our travels around the World this has to be one of the nicest. 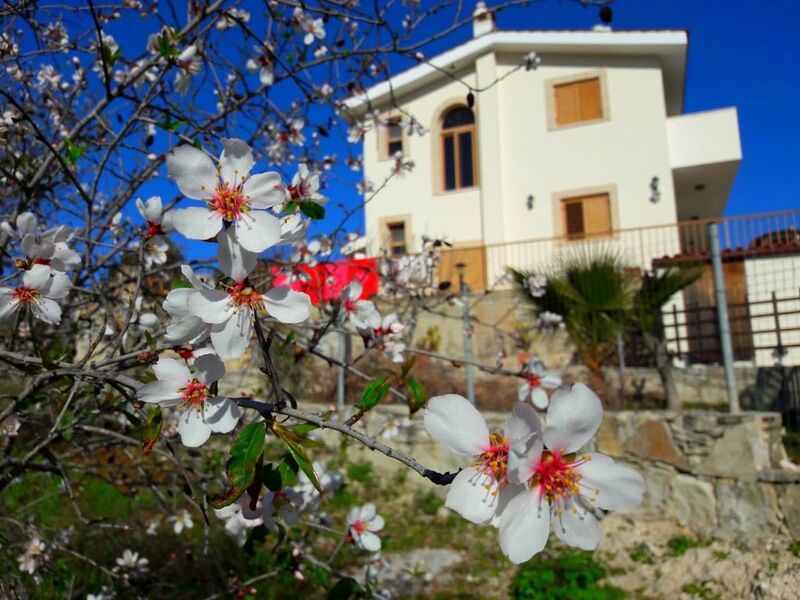 Connie’s Villa, as we came to call it, is set in beautiful surroundings with a view of the Trodos Mountains which is to die for. “A room with a view “ really doesn’t do it justice, as you are actually sharing the Home of your Hosts in every sense. Connie and Burkhard are two of the loveliest people you could wish to meet and it was an honour and a privilege to meet them, to to share their company and to break bread at their table. They have two rooms to offer Guests, one with an en-suite bathroom and one with a bathroom just across the landing. If you opt for the latter remember to pack your bathrobe. The rooms are well appointed, with more than adequate storage space and spotlessly clean. If there is anything you require that is not to hand, then just ask and Connie or Burkhard they will sort it for you. Finally, if you appreciate a clear night sky, then take your binoculars or a telescope. There is no light pollution and, provided there is no cloud cover, you can survey the Firmament in all its glory. Oh, and if you like cats, then this is the place for you, there were four new arrivals during our stay. Danke liebe Freunde, bis wir uns wiedersehen. ich war im März 2019 für eine Woche bei Conni, es sind sehr nette, hilfsbereite Menschen, das Zimmer ist sauber und anständig eingerichtet. Die Gegend ist sehr schön und entspannend. Die Wohnung entspricht vollumfänglich den in der Beschreibung geschilderten Details, ist liebevoll eingerichtet und mit dem Mietwagen von Paphos aus gut zu erreichen. Für uns war das ein idealer Ausgangspunkt zu den Sehenswürdigkeiten, Städten, Wanderungen und Stränden der nahen und weiteren Umgebung. Die herzlichen, aufmerksamen Gastgeber helfen immer gern bei Fragen und Wünschen, geben wertvolle Tipps und machen den Urlaub zum Wohlfühlerlebnis. Wir haben den Aufenthalt sehr genossen, uns sehr willkommen gefühlt und nicht zuletzt auch jeden Tag den unglaublichen Terrassenblick am Morgen und den Sternenhimmel am Abend genossen. Eine Unterkunft, die wir uneingeschränkt weiter empfehlen können. nossa casa com varanda e piscina está localizada entre Lemona e Kallepia na pequena aldeia de montanha Letymbou. cerca de 20 minutos de Pafos e Polis A casa é cercada por oliveiras e amendoeiras ... ao redor da casa você sempre encontrará lugares ensolarados, mas também com sombra para relaxar. A vista do seu quarto privado é de tirar o fôlego. você olha diretamente de lá para as montanhas Trodos e você pode apreciar o nascer do sol pela manhã. Aproveite a piscina ... prepare uma refeição quente no churrasco ao ar livre.